GM does have a lot to celebrate in its class-dominating race program and the C6 is a pretty fabulous car despite what Corvette detractors might say. The Z06? Even more so. 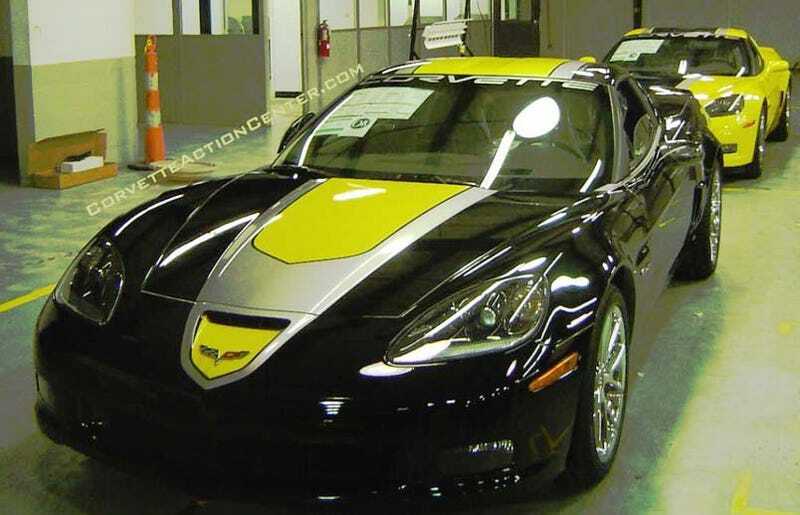 But painting one up in black and yellow and calling it a special edition still feels a might bit silly even with what the Corvette team views as added value componentry. But, since inception Corvette has utterly dominated it's GTS class (due in part to class emptiness) and this edition is designed to pay homage to those rip-snorting race cars. SEBRING, Fla. – The Mobil 1 Twelve Hours of Sebring, the season-opening race of the 2009 American Le Mans Series to be held on March 21, will mark the start of Corvette Racing's 10th anniversary in international road racing. The team made its competition debut in February 1999 at Daytona, and competed in its first Sebring 12-hour race the following month, finishing fourth in the GTS class. Since that modest beginning, Corvette Racing has become one of the world's premier production sports car teams, winning eight consecutive ALMS GT1 manufacturers and team championships, seven straight drivers' titles, and five class victories in the 24 Hours of Le Mans. Chevrolet is commemorating Corvette Racing's decade of success with the introduction of the GT1 Championship Edition Corvette. These limited edition vehicles (designated Regular Production Option GT1) will be available in coupe, convertible, and Z06 models in yellow or black livery. With graphics packages inspired by the championship-winning Corvette C6.R, the GT1 Championship Edition Corvettes will make their public debut at Sebring International Raceway. Production is scheduled for spring. "There have always been strong ties between production and racing Corvettes," said GM Racing manager Mark Kent. "Technology developed by Corvette Racing is applied to improve the efficiency, performance, handling, aerodynamics and safety of production vehicles. Now with the introduction of the GT1 Championship Edition Corvettes, the link between the race and street versions is apparent at a glance. Corvette enthusiasts will be able to purchase cars that celebrate the remarkable history of Corvette Racing. The GT1 Championship Edition program is another example of how racing helps Chevy sell cars and trucks and provides a solid return on investment." The ALMS season-opener also will mark the final appearance of the Corvette C6.Rs in the GT1 class in the Sebring 12-hour endurance classic. The twin Corvette C6.R race cars (chassis Nos. 5 and 6) are beginning their third season, and are scheduled to be retired in preparation for new global GT class rules that will take effect in 2010. These two cars have accounted for 23 of the team's 74 wins. Corvette Racing has scored six class victories in Sebring, and Johnny O'Connell, driver of the No. 3 Compuware Corvette C6.R, notched his record-setting seventh Sebring win in last year's event. O'Connell and Jan Magnussen, the reigning GT1 champions, will be joined by Antonio Garcia at Sebring, while three-time GT1 champions Oliver Gavin and Olivier Beretta will be teamed with Marcel Fassler in the No. 4 Compuware Corvette C6.R. The addition of Garcia and Fassler for long-distance races will bring the total number of Corvette Racing drivers to 19 since the team's inception. Corvette Racing will be powered by cellulosic E85R ethanol fuel at Sebring for the first time. The team adopted the renewable fuel made from wood waste after last year's Sebring race, and used E85R throughout the remainder of the 2008 ALMS season. Cellulosic ethanol was one of the key ingredients in the team's overall victory in the inaugural ALMS Green Challenge in the 1,000-mile Petit Le Mans held at Road Atlanta in October 2008. The winning No. 3 Corvette C6.R achieved the best overall score based on performance, fuel efficiency and environmental impact under criteria developed by the U.S. Environmental Protection Agency, the U.S. Department of Energy, and SAE International. Corvette Racing's use of an alternative fuel on the race track reflects GM's commitment to producing fuel-efficient vehicles for customers – there are 3.5 million E85-capable GM FlexFuel vehicles on the road today.